Block Print Magic is an essential guide to the techniques of linoleum block printing, with step-by-step images and a gallery of finished works for inspiration and visual demonstration. 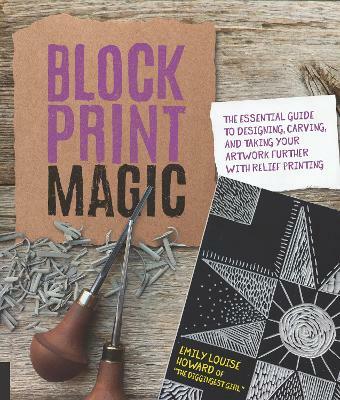 Block Print Magic is the perfect reference for a wide range of printmaking enthusiasts. The easy-to-follow illustrated instruction takes printmakers through every step of the process, beginning with choosing and caring for tools and setting up a studio, through design essentials, carving techniques, and printing techniques. Those techniques include multi-block printing, reduction cuts, puzzle blocks, and rainbow-roll printing. Advanced carving techniques for creating textures, crosshatching, and three-dimensional shading will give more experienced printers the opportunity to expand and strengthen their expertise. Along with author Emily Howard's own work, the book's gallery includes interviews with and examples of work by five other contemporary artists as a means of clarifying how each technique can be used in different ways. Block Print Magic is a must-have addition to any printmaker's bookshelf. Emily Howard is the heart, hands, and mind behind The Diggingest Girl* - the name of her print business and Etsy shop. Along with selling her work online, Emily shows her work throughout the year at print, art, and craft exhibitions from Michigan to Georgia. Emily was born in Vermont, raised in Kentucky, and educated at the University of Kentucky, where she received a BFA in painting. Emily went on to get her MFA in painting and her MAAE with K-12 licensure at the University of Cincinnati. She carves her blocks and prints her work full time in Erlanger, Kentucky.